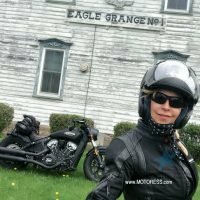 What is the best way to get to know a motorcycle? Take it on a long journey and that’s what I did with the 2018 Indian Scout Bobber. 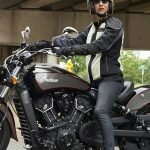 After clocking over 2,400 miles (4,000 kilometres) in four days I can say I have a complete understanding of the new midsize 2018 Indian Scout member. 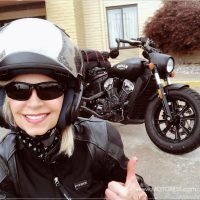 And, if given the chance, I’d take the Scout Bobber on a long ride, all over again! The folks at Indian told me the Bobber model is ideally for an urban environment. Given its looks and setup, rightly so. Yet my ride was a tour from Buffalo to Atlanta and return with what I refer to as a “dash” of urban on the side. 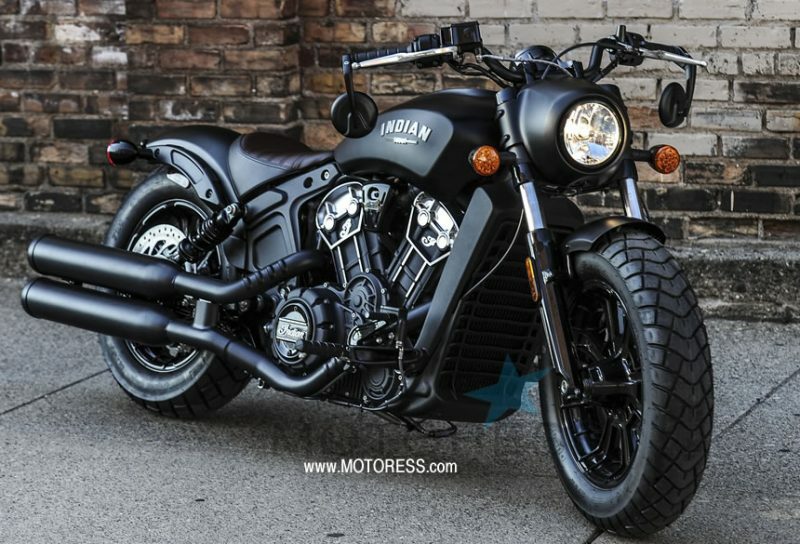 So here I present to you the Indian Scout Bobber as an old school styled, urban or across country ride. This stripped down, blackened, bobbed-out ride goes the distance. It offers an all-round experience that answers not just your power cravings or your road presence demands but your “off the line” go factor – all that plus the ability to take you far away. 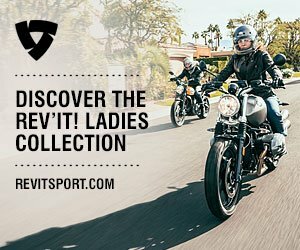 The first Indian Scout was introduced in 1920 and has been part of the portfolio throughout the brand’s history. 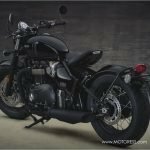 The Bobber today, is based on the 2018 Scout’s popular liquid-cooled V-twin standard model. 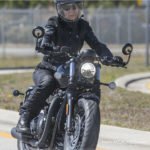 The engine and drivetrain are unchanged while the addition of styling modifications make the Bobber appear and ride like the 1940s and 50s old-school “bobbed” custom. Its low-slung shape and lowered rear suspension deliver feedback from every inch of the road. 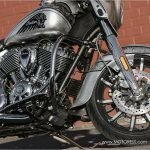 The “street tracker” handlebars and slightly forward pegs 38mm (1.5 inches) allows for a more “all in” riding position giving more feel to its manoeuvring. The knobby tires and blacked-out wheels simply add to the 40’s/50s styling while offering control and grip to the road. 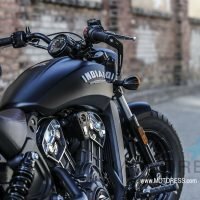 Indian Scout Bobber Narrow, Lower, Fun! The Scout Bobber is a midsize motorcycle and isn’t a tall bike. It’s easy to get your feet down when you’re stopped making manoeuvring within a short space or say, walking it around for parking, totally manageable. It weighs 251 kg / 554 lbs (with a full tank of fuel) which again, is a weight which makes you feel ever more in charge confident and comfortable-even in slow traffic. The Scout Bobber has a reduced rear suspension travel by 26mm.There’s a new Indian logo tank badge which looks fabulously retro. Its frame, exhaust, handlebars, mirrors and total look is finished in a matt Thunder Black. There are other colour options available. Its mudguards are hacked down and the rear is slimmer, showing off its chunky, knobby 150/80 x 16 rear tire and 130/90 x 16 front tire. The engine keeps its pace and pulls continuously into the higher revs. There is plenty of torque. Clutch, gearbox and throttle are light, accurate and a pleasure to use. The sound of its duo slash-cut exhausts bring an accent to the power. The Scout Bobber handles, stops and grips with amazing stability and precision. The lower ground clearance does prevent its cornering limits yet you’ll feel in all scenarios your ride a well-balanced chassis. It does translate the road firmly, so you feel the major bumps. Its single-disc, twin-piston front brake set-up has a surprising amount of power for a bike like this and of course on board ABS means you’ll have full braking control when needed. 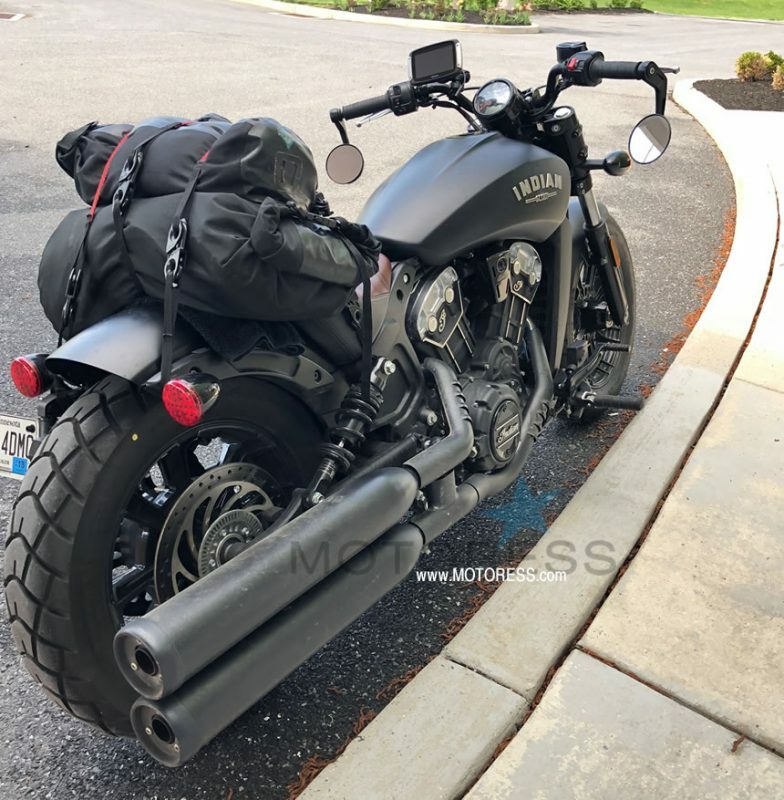 There is a large choice of Bobber accessories to choose from including saddle bags and rack bag for when you’ll be taking more of those long rides. 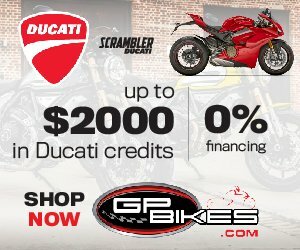 In 1953, when the Indian Motorcycle Manufacturing Company went bankrupt. Various organisations tried to preserve the Indian brand name in subsequent years, with limited success. 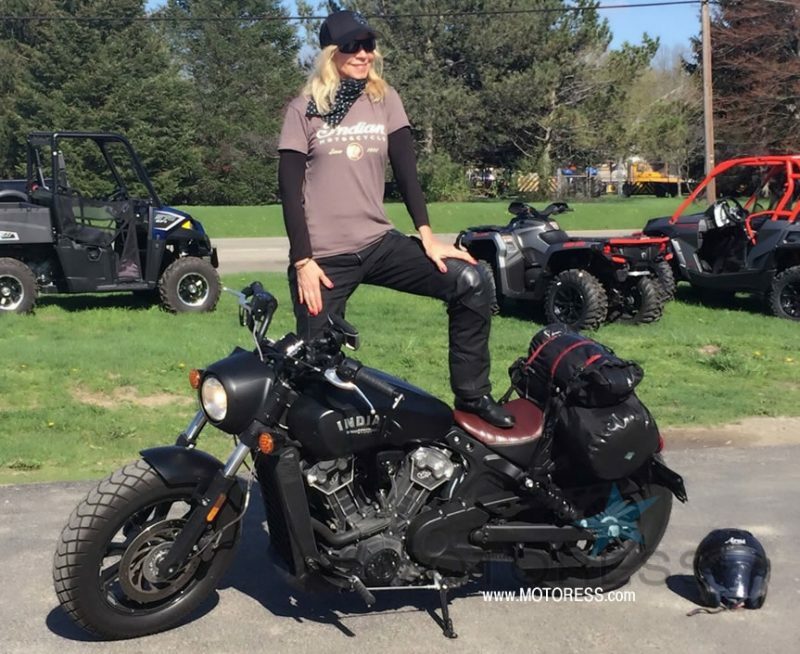 In 2011, Polaris Industries purchased Indian Motorcycles and moved operations from North Carolina and merged them into their existing facilities in Minnesota and Iowa. 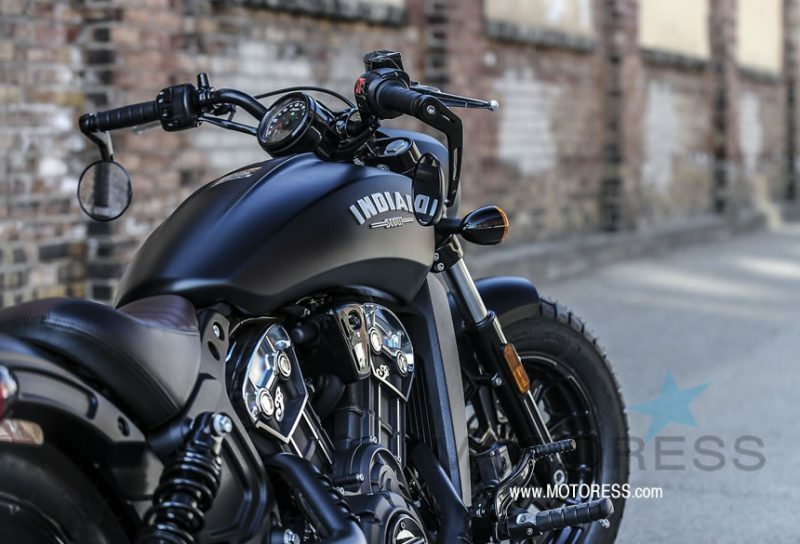 Since August 2013, Polaris has marketed multiple modern Indian motorcycles that reflect Indian’s traditional styling. 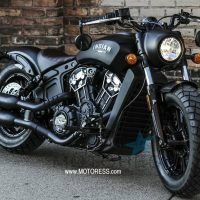 With a five-billion-a-year company behind this ride, the Polaris-made Indian Scout Bobber is solidly built and well finished. 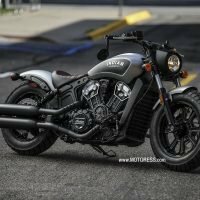 Who Is The Indian Bobber Scout For? The Scout Bobber is a head turner yet this is a very specific style of motorcycle which I say, is worth embracing. It is as powerful as it looks and as I experienced, super fun to ride! 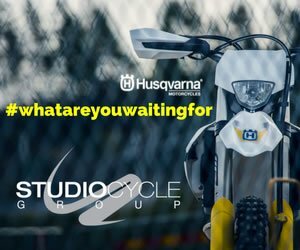 If this is the style of motorcycle which fits your personality, then you’ve nothing more to worry about. 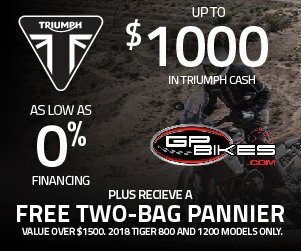 You’ll have a total ride package. The Scout Bobber mixes old-school design and modern-day performance while standing strong in its American made heritage. So urban yes, and long distance yes, but little room for taking a friend along or carrying a lot of gear. But if you travel light like I do, you’ll manage. I was able to tie cargo on over the rear mudguard. I first put a soft cloth on the mudguard to prevent scratch and then used my Lynx Hooks to fasten my two dry bags. Worked like a charm! 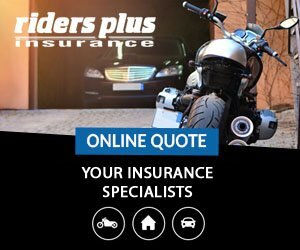 If you’re fussy about a tougher suspension you will feel the low ground clearance to your body through the suspension when riding over bumps and particularly those on the faster roads which come out of nowhere. This is the only negative I experienced on this model. 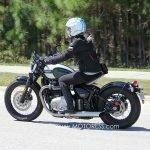 The fact that the Scout Bobber has a solo seat may mean that the riding position may not be a great fit for everyone. Though it was perfect for me. 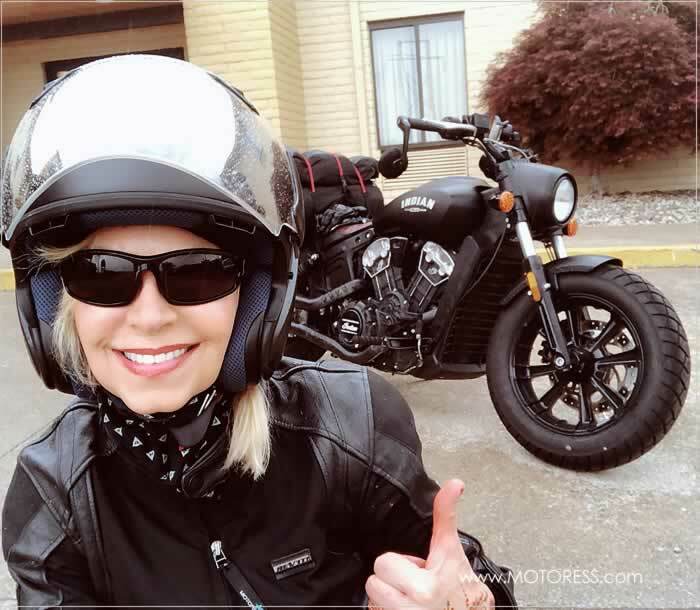 The Scout Bobber’s power, excellent handling and trustworthy quality will indeed compensate for those bumps in the road! 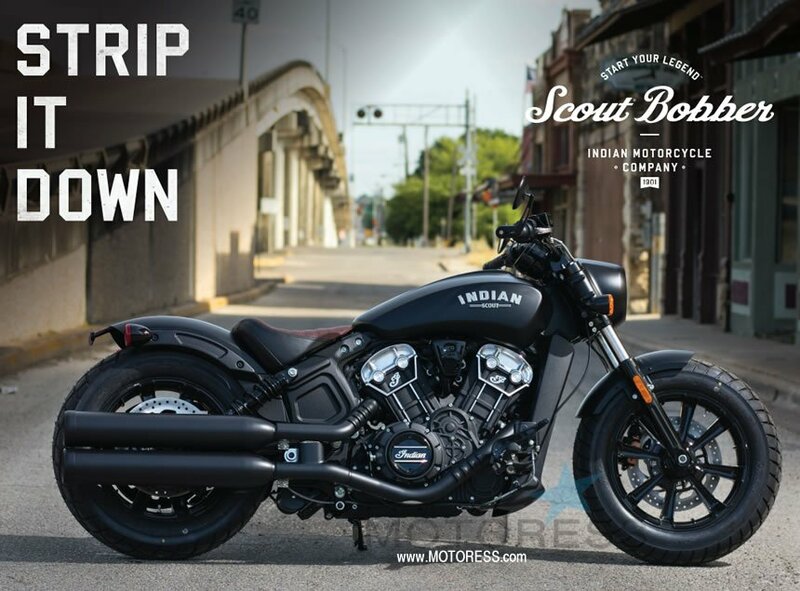 There is no doubt you will stand out from the crowd on the 2018 Indian Scout Bobber. 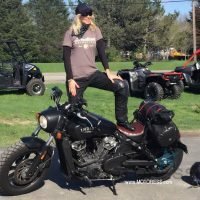 Don’t rule out riding the Scout Bobber for long distances. Take it from me, it may work out for you as well as it did for me. 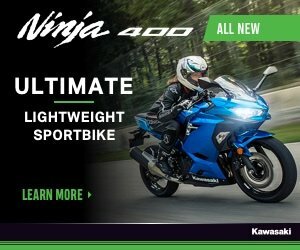 The power, the ride, the performance and the fun feel while cruising along the road offers more satisfaction than you imagine – until you try it for yourself. 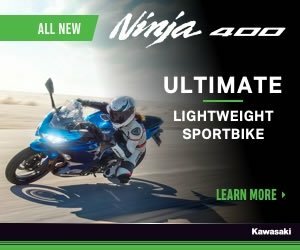 Starting at MSRP of $11,499. USD I’d say is excellent. 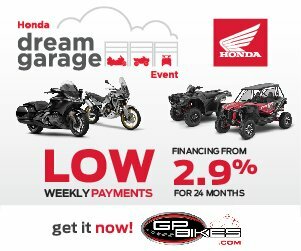 You’ll get a lot of bike for the price. I don’t recommend the underside mirrors however. 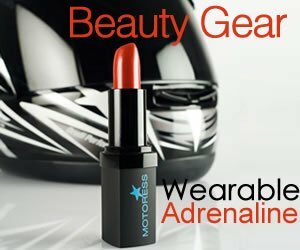 These were on the Bobber I reviewed. I had to look down taking my vision away from the road ahead to use them, which is not a proficient riding practice. 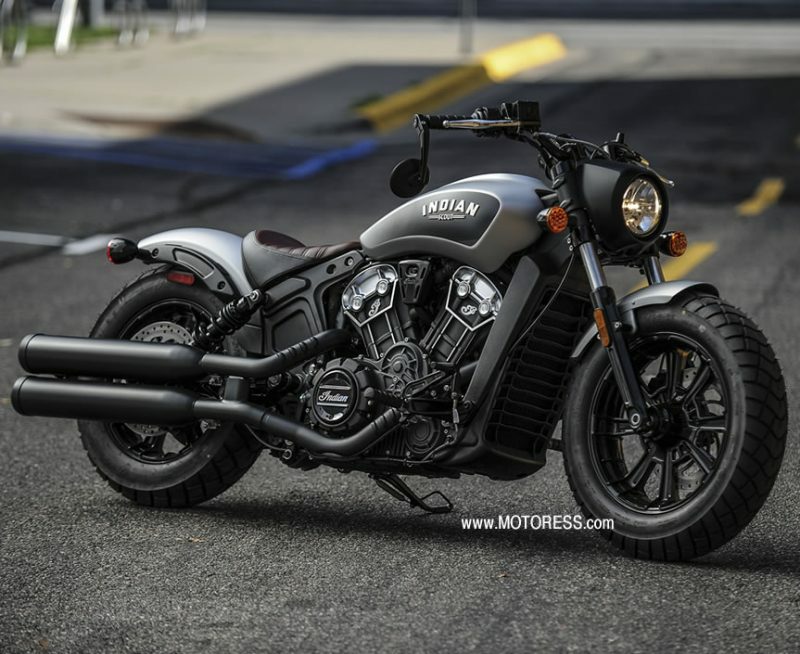 Read more about the Indian Scout Bobber on the Indian Motorcycles website. 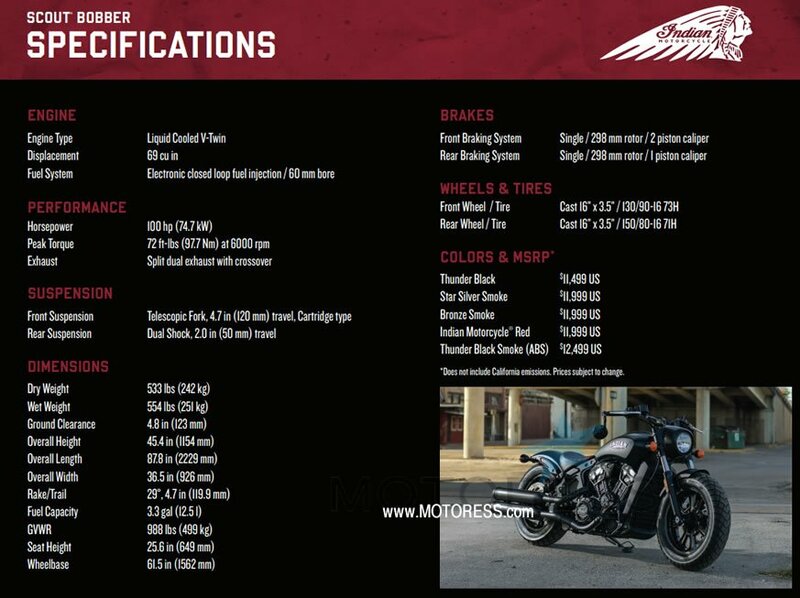 Find an Indian Motorcycle dealer and test ride the 2018 Indian Scout Bobber!